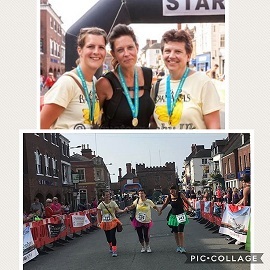 Congratulations to Miss Lee, Mrs Loft and Mrs James who completed the 22 mile walk on Bank Holiday Monday, it's fair to say they had some very tired feet at the end of it. If you have sponsored the ladies if you could let us have your sponsor money as soon as possible so that we can give you a total raised ......... at the moment it is in the region of £800.00. Fabulous work ladies - Well done! Miss Lee, Mrs Loft and Mrs James are attempting the Bridgnorth Lions 22 mile wallk on Monday May 28th in aid of St. Laurence's adventure playground. If you would like to sponsor one/all of them there is a sponsor form in the main reception or speak to them at school.